The authors are distant cousins. They are great-great-grandchildren of John Macdonald of Balinoe, Tiree, who emigrated to Australia in 1853. Keith, a descendant of John Macdonald's eldest daughter, Catherine, is a retired animal scientist. Barbara, a descendant of John Macdonald's eldest son, Hugh, is a plant pathologist. Two things must be remembered about the poorer emigrants: because they had been accustomed to great hardship, they were able to tolerate conditions on the voyage out that today seem intolerable; secondly, harsh though their lives had been, very few of them were happy to leave home. Assisted immigration was funded by land sales in Australia and was managed by the Colonial Land & Emigration Commission in the United Kingdom. Various charitable groups were also involved. One of the best known of these was the Highland & Island Emigration Society, which assisted 963 impoverished Scots families, a total of 4,910 people, to emigrate to Australia in the 1850s. On the nomination of the owner of the estate from which the family came, the Society advanced funds to enable the family to qualify for an assisted passage to Australia under the conditions of the Colonial Land & Emigration Commission. John Macdonald and his family were nominated to the Society by the Duke of Argyll, as were two other families from Tiree. Seventeen families from Coll were nominated by the estate owners of that island. Some emigrants felt shamed by the circumstances of their emigration and told fabricated stories to their children and grandchildren that were passed down as family folklore. 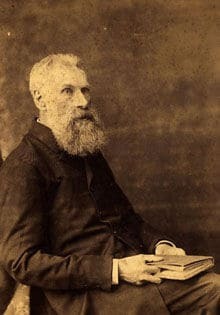 For instance, the story handed down to us as children was that our great-great-grandfather, John Macdonald, had to leave Tiree and emigrate to Australia because he married a Campbell woman, which violated the code of enmity between the Macdonalds and Campbells that had existed since the 1692 Massacre of Glencoe. However, except for the islanders’ fear and hatred of Colonel John Campbell, the Duke of Argyll’s factor in the 1840s and 1850s, our researches did not uncover any evidence of enmity between the Macdonalds and Campbells in Tiree. In fact, John Macdonald’s mother was a Campbell and there had been no apparent opposition to her marriage, so why would there have been any opposition to his? Our conclusion was that the story of local inter-clan enmity was fabricated, possibly to hide the fact that they were nominated to the Highland & Island Emigration Society as an impoverished family. The reason for their impoverishment is not known, except that it occurred in the famine years of crop failures, starvation and disease. It may have been that the family was evicted, or threatened with eviction, from their croft at Balinoe, possibly because of defaults in rent payment, and so had little alternative other than to accept the terms of forced emigration that were offered. The enforcer would have been Colonel John Campbell, which might explain the family folklore story of enmity between the Macdonalds and the Campbells in Tiree. The shame that our ancestors felt about being sent to Australia as impoverished immigrants was very real to them. But present-day descendants do not see the circumstances of our ancestors’ emigration as a cause for shame. Rather, we celebrate the fact that our ancestors rose above their difficult beginnings to become the builders of a new nation on the other side of the world. We look back to their homeland to try to discover where their drive and never-give-up approach to life came from. 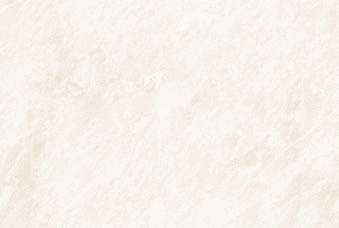 The Australian character, said to be brash, self-sufficient and self-confident, derives from these beginnings. Until the mid-1850s, sailing time to Australia of 5-6 months was common. In England, companies advertised sailing times of 4 months, but few ships achieved this. It depended on the sailing speed of the ship and how long it was becalmed in the doldrums around the equator. Leaving England, the ships sailed south in the Atlantic Ocean to Cape Town, where they were re-provisioned, then sailed directly east across the Indian Ocean to Australia. After the mid-1850s the route was non-stop, sailing south of Cape Town to pick up the Roaring Forties for a high-speed dash east across the Southern Ocean to Australia. This new route reduced sailing time to Australia, which pleased the ships’ owners but terrified the passengers because of the heavy seas, extreme cold and the occasional iceberg encountered in the Southern Ocean. From about the mid-1850s, many of the sailing ships were fitted with coal-fired auxiliary steam engines. The engines were small and powered only a single screw but they enabled the ships to make headway through the doldrums, thus saving weeks of passage time. Sailing times of 75-80 days could be achieved by using the non-stop route and the auxiliary engine. All assisted immigrants, and most of those paying their own fares, travelled in steerage, a low-ceilinged space beneath the main deck. This was divided into three sections, separated by bulkheads: single men and youths at one end; married couples and young children in the centre section; and single women at the other end. In each section, the accommodation consisted of a double tier of bunks on each side and a long table with fixed forms down the centre. Commonly, the bunks were three feet wide and were shared by two people. It was cramped and noisy, and in the tropics it was stifling. There was little privacy. As was the practice when immigrant ships arrived at Portland, townspeople and farmers from the local area or further afield in western Victoria or South Australia came to the ship to hire employees to replace those who had left for the gold diggings. The name and address of the employer, the agreed wage and period of employment (commonly 6 or 12 months) were entered in the passenger list. Some immigrants, such as John Macdonald, chose to try their luck on their own and were entered as “On Own Account”. * Outbreaks of communicable diseases such as typhus, known as 'ship fever', sometimes caused many deaths among steerage passengers. One of the worst of the Australian 'plague ships' of the 1850s was the "Ticonderoga". Ninety-six passengers died on the voyage and a further 80 in quarantine in Melbourne. Uncle John spent many of his young days in the city, learning everything that ought to make a man accomplished. He was naturally smart, stood six feet high, and was as handsome as any McDonald that ever walked the earth. He was pleasant and good-hearted and did not how to be stingy. He knew navigation, land surveying and engineering, and could make machinery from the needle to the anchor, as the saying was in those days. He was skilled in the exercise of sword, gun and bayonet, and he was one of the best singers. No wonder I liked his company; he was so full of sunshine and anecdotes that one never tired of him. In the days of my early girlhood I was too much of a tomboy to think of anything but having a good time, and to have one I had only to go on an excursion with Uncle John. Sometimes he would come to our house, bringing two horses, and would tell mother she would kill me for want of exercise; then he would ask her to let me go with him, and she would consent for no one could or would refuse him. John was a blacksmith by trade, as was his elder brother, Donald, and as were their father and grandfather before them. At the time of the 1841 census John was unmarried and working as a blacksmith at Balinoe with his brother Donald. John re-married in 1848, so Flora MacPhail must have died within a few years of Mary’s birth. However, because no records of deaths or burials were kept at that time, the circumstances of Flora’s death and the site of her burial are not known. Mary must have died also because she was not counted in the 1851 census. b. Tiree? Died in infancy. No baptismal record. b.c. 1853, Tiree. No baptismal record. b.c. 1857, Victoria. No birth record. In the 1851 census, John Macdonald is shown as a crofter of 15 acres living at Balinoe with his wife, Flora, and children, Catherine and Hugh. Two years later, on 3rd November 1853, the family sailed from Liverpool for Australia as assisted immigrants on the ship S.S. "Utopia". They received a cash advance from the Highland and Island Emigration Society, as did many other impoverished Scots families, to pay the deposit and other costs involved in applying for assisted passages to Australia and to pay for their travel to the port of embarkation. There are no written records of John Macdonald’s thoughts about the circumstances of his leaving of Tiree, but we can deduce from the oral stories handed down to his descendants that they were bitter. The S.S "Utopia" arrived at Portland, Victoria, on 25th January 1854, and rather than accepting employment as a farm labourer for himself and domestic service for his wife, John Macdonald chose to strike out on his own. We have been unable to track his movements until 1859, when the family was settled at the goldfields town of Ararat in central Victoria. In official documents of the period John Macdonald’s occupation is given either as “Blacksmith”, “Miner” or “Gold Miner”, so it seems he ranged between the two occupations. John Macdonald’s wife, Flora Campbell, died at Ararat on 18th July 1865 following the birth of a daughter, named Flora after her mother. John continued living in Victoria for the next 23 years, but little is known of this period in his life. He did not re-marry. His son Hector died at Ararat in 1867 aged 14. His daughter Flora died in 1871 aged 5. In about March 1888, then aged 78 and in ill-health, John Macdonald moved from Victoria to New South Wales to live with his daughter, Catherine, and her husband, Edward Dash, who had settled in Sydney in 1886 after leaving Ararat. He died at his daughter’s home in the Sydney on 16th August 1888. The official cause of death was given as bronchitis-asthma, but subsequent family history suggests that it may have been pulmonary tuberculosis, which, associated with silicosis, was prevalent in underground miners working gold-bearing quartz in Victoria. John was buried in the Presbyterian Section of Rookwood Cemetery, Sydney. A few years later, his daughter, Catherine, and son-in-law, Edward Dash, were buried beside him. Flora Campbell, the 16th of 18 children of Hector Campbell & Ann McEachern of Balinoe, Tiree, was born in 1829 and was baptised on 13th August of that year. On 29th November 1848, at 19 years of age, she married John Macdonald of Balinoe, a 39-year-old widower with one or two young daughters*. Nothing is known of Flora’s early life in Tiree, except that, from later records in Australia, we can deduce that she was taught to read & write in English. Flora accompanied her husband, their two surviving children & her stepdaughter, Catherine, to Australia in 1853. The family settled in the goldfields town of Ararat, in central Victoria, where John Macdonald worked at his old trade as a blacksmith and as a miner. Five more children were born in Australia. Flora died of puerperal fever on 18th July 1865, three weeks after the birth of a daughter named Flora after her mother. She was buried in the Ararat Cemetery. It seems likely that, after the death of her stepmother, Catherine, then aged 21, became ‘mother’ to the younger Macdonald children. * The second daughter, Mary, died in infancy or early childhood, but it is not known if this occurred before of after John's marriage to Flora Campbell. Catherine Macdonald, elder child of John Macdonald and Flora MacPhail of Balinoe, Tiree, was born on 7th March 1844 and was baptised a few weeks later on 31st March. Her mother died some time between 5th January 1846, when Catherine’s sister Mary was born, and 29th November 1848 when her father re-married. Mary died in infancy or early childhood. In 1853, at the age of nine, Catherine emigrated to Australia with her father, stepmother and two younger half-brothers, Hugh and Hector. The family settled in the goldfields town of Ararat in central Victoria. * The youngest Macdonald child, Flora, died of an acute illness at the Dash family home, South Hamilton, in 1871. Catherine was a gentle, serene woman, greatly loved by her children. It was said she had the power of “healing hands”. Her son, Ebenezer, said that when she held his hand he would feel no pain. He related the time when, as a child, he fell out of a tree and broke his leg in three places. His mother held his hand while his leg was pulled into shape and set, and he felt no pain while she did so. To encourage her children to be equally proud of their Macdonald and Campbell ancestry, Catherine gave the middle name Macdonald to some of her children and Campbell to others. Today, four generations later, they still appear as middle names among some of her descendants. After her marriage in 1866, Catherine lived in Hamilton with her husband and increasing family until the end of 1875. In 1876 Edward Dash was transferred in his job to Kerang, a town in northern Victoria, and his family moved there with him. Edward continued to be very active in community organizations and Baptist Church affairs. Edward Dash retired from the Victorian Treasury Department at the end of 1880. He was appointed Baptist pastor at Ararat and returned there with his family in 1881. He ministered there for five years then in1886 the family moved to Sydney. The reason for the move is not known, but it may have been that Edward was persuaded by two of his sons who had settled there a few years previously. Hugh Macdonald, the eldest of nine children of John Macdonald and Flora Campbell, was born in Tiree on 12th February 1850. His birth and baptism were recorded in the Tiree Parish Register as “John McDonald crofter of Balinoe and Flora Campbell his wife had a son born 12th Feb and baptised 5th March 1850 under the name Hugh”. He emigrated to Australia at a young age with his father, mother, half-sister Catherine and younger brother Hector, arriving at Portland, Victoria, on 25th January 1854. Little is known about his early life in Australia, but it is assumed he was schooled in or near the gold mining town of Ararat, in central Victoria, where his younger siblings were born. A letter written by his brother George in 1929 mentions walking home from school with Hugh and Hector when George was “a wee chap”, but with no mention of where. Hugh trained as a schoolteacher. The official record shows that he started teaching from 1st November 1873. After 1½ years, possibly as a trainee, he was licensed on 1st January 1875 and appointed for 6 months to the primary school at Timor, near Maryborough about 150km north-west of Melbourne. In June 1875 he was appointed head teacher at Yulecart, about 5km out of Hamilton. For six months in 1888 Hugh was teacher at Timor West, then in December 1888 he was appointed head teacher at Granya, a gold mining village on the Upper Murray River about 40km east of Albury-Wodonga. He must have enjoyed the challenge of teaching in what was then a frontier community because he stayed at Granya for 12 years and became something of a local legend and the school’s longest serving teacher. He was said to be “a stern disciplinarian in the true Scottish teaching tradition” . He was actively involved in local community groups, as well as working to improve the school grounds and facilities. In 1889 he requested that the school be fenced to protect the building from the stench of animals that sheltered by its walls at night. This was eventually done in 1891. When he left in 1900 the local paper reported in detail the farewell social attended by “about 150 persons”, which included most of the people of note in Granya and the surrounding district. Five of Hugh and Mary Grace’s 13 children were born at Granya, and two more rooms had to be added to the teacher’s residence to accommodate the growing family. But it was not all joy for them. On 12th May 1889 their 2-year-old daughter, Grace, drowned in a shallow pool near the school. In a telegram to the Department of Education Hugh wrote “My daughter Gracie was drowned yesterday please grant few days leave to bury child”. Afterwards, he wrote a heart-wrenching letter to the Department describing the circumstances of his daughter’s death . At Hugh’s request, an area of 5 acres containing the spring and pool where his daughter drowned was gazetted as school land in 1899, with the intention of developing it “into a suitable swimming place for children”. Hugh left Granya in 1900 to take up the position of headmaster at Shepparton Primary School. After nine years in Shepparton his final appointment was as headmaster at Geelong South Primary School. He retired in February 1915 at age 65 with an annual pension of £211/2/2. The Education Board reports on his performance during his 41 years of service as a State School teacher were almost always complimentary, with descriptions of him and his teaching as “manly”, “methodical”, “intelligent and capable”, “kind and fatherly”, “energetic” and “progressive”. Hugh, Mary Grace and assorted remaining children moved to the Melbourne suburb of Brunswick after his retirement. Grandchildren remember many Sunday dinners after church, with 30 or more people and long graces. He was remembered as a man of good humour. His daughter Daisy used to tell a story of waiting for him to exit the shower in the morning. To her question, “Will you be long, Father?” his response was invariably “Only about 6 feet 2 inches, Daisy”. Hugh was a very religious man, reading aloud from the Bible after dinner. He is remembered as a tall imposing man and Mary Grace as a small woman always dressed in black. Hugh wrote a letter addressed to his “Dear Wee Wife” while staying with step-son Gib and family just a couple of months before his death. He was an active and fit man, and apparently on 11th November, two days before his death, he had walked from his home in Brunswick to the War Memorial in Melbourne for the Remembrance Day service. Granddaughter Grace remembers him as “a really nice Grandpa” who took her to the Royal Park Zoo near their home. He died of heart failure on 13th November 1927 at his home in Brunswick. Mary Grace died, aged 87, on 30th November 1942 in hospital at Coburg. Both are buried in the Presbyterian Section of the Melbourne General Cemetery, with Mary Grace’s first husband. The broken headstone reads “Sacred to the memory of Thomas Gibson Hamilton late of the Bringalbert Station near Apsley who died on the 2nd April 1875 aged 30 years”. 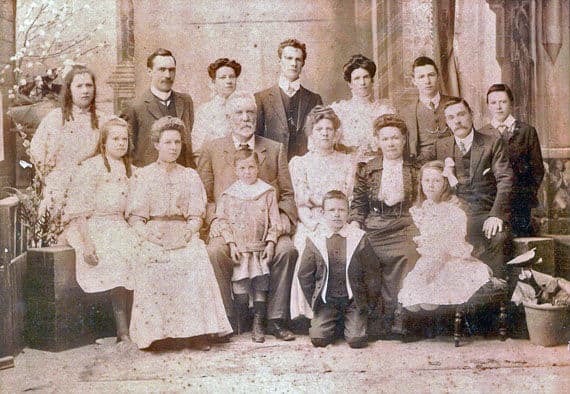 Hugh Macdonald & family c.1900. Back row L-R: Mona, Hector, Dulcie, Keith, Flora Dash (niece of Hugh), Hugh, Norman. Front row L-R: Daisy, Kate, Hugh snr with Rex, Ruby, Mary Grace, Mavis, Gib Hamilton. The second son of John Macdonald and Flora Campbell, Hector was born in Tiree c.1853. There is no record of his baptism in the parish register. He was an infant when the family emigrated to Australia. He was described in a letter written by his brother George as “a generous big-hearted lad, but quick tempered and would fight at the smallest provocation. “He was very tall for his age, and when he died he was just under 6ft in height”. Hector was aged 14 when he died of acute pneumonia on 17th June 1867 at Ararat. He was buried in the Ararat Cemetery with his mother. John Macdonald (b. 1857?). There is no record of his birth but he was living, aged 31, at the time of his father’s death in 1888. No other information is known. George William Campbell Macdonald (1859-1931). Born at Ararat on 28th March 1859. He was aged 6 when his mother died in 1865 and he came to rely on his elder brother, Hugh, who he later described in a letter to his niece as being “a mother as well as a brother” to him. He trained as a school teacher in Victoria. In 1883 he married and moved to New Zealand with his wife, who died two years later. He re-married in 1888 and had a family of nine children. He continued his teaching career in New Zealand, becoming headmaster of Ravensbourne School in 1899 and then Macandrew Road School in 1908, where he stayed until retirement in 1924. He died in New Zealand in 1931. Archibald Macdonald (b. 1861). Born at Ararat on 5th August 1861. 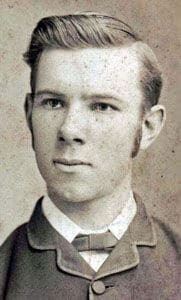 He was living, aged 27, at the time of his father’s death in 1888. No other information is known. Annabella Macdonald (b. 1863). Born at Ararat on 14th July 1863. She was living, aged 25, at the time of her father’s death in 1888. There is a suggestion in family records that she married a man with a name like Jeavons Fellowes and had a daughter, Enid. No other information is known. Flora Macdonald (1865-1871). Born at Ararat on 24th June 1865. Her mother died three weeks later. It is thought that Flora and her siblings were then cared for by their elder half-sister, Catherine, and after Catherine’s marriage to Edward Dash in 1866 Flora and the younger Macdonald children lived with them at South Hamilton. Flora died, aged 5, at the Dash home at South Hamilton on 16 April 1871. The cause of death was entered in the register as “epilepsy” of three days duration, but it may have been the infection now known as meningococcal meningitis. Flora is buried in the Baptist Section of the Hamilton Cemetery with her young cousin, Hugh Dash, who died suddenly a few years later of “inflammation of the brain”. The headstone reads: “Erected by Edward and Catherine Dash in memory of their little sister Flora McDonald who died suddenly April 16 1871 aged 6 years and also their eldest son Hugh who fell asleep in Jesus 9 April 1875 aged 8 years and 6 months”. Hugh Benjamin Dash (1866-1875). Born at Hamilton on 15th November 1866. He collapsed on the roadway when walking home from school on 8th April 1875 and died early next morning at his parents’ home. The cause of death was given as “inflammation of the brain”, which may have been the disease now known as meningococcal meningitis. 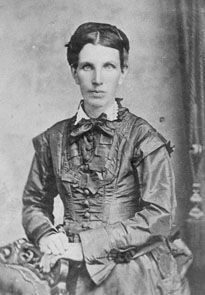 Mary Catherine Dash (1868-1877). Born at Hamilton on 29th April 1868. She died at Kerang, on the Victorian side of the Murray River, on 21st April 1877, a few days before her 9th birthday. The cause of death was stated as relapsing fever and exhaustion of 13 days duration. However, it seems unlikely that it was the disease known today as relapsing fever, which is associated with conditions of severe poverty, overcrowding and poor hygiene. Ebenezer Dash (1870-1927). Born at Hamilton on 8th April 1870. He was named after a prominent Baptist minister, Rev. Ebenezer Henderson, and in later life joked that he was glad he wasn’t named Jeremiah, which would have been worse. He was schooled in Victoria, and in 1886 came with his family to Sydney where he joined the NSW Department of Public Instruction (later the Department of Education) as a pupil teacher. He was selected in the first intake of pupil teachers to undertake studies at the University of Sydney, from which he graduated Bachelor of Arts in 1894. His mother died in 1890 and his father in 1891, so at the age of 21 he became ‘father’ to his 7 siblings, ranging in age from 3 to 19. Despite this difficult beginning he had an outstanding career as a teacher, rising to the position of headmaster at an early age. He played a leading role in the formation of the NSW Public School Teachers’ Association and served four terms as its president. He was foundation president of the Australian State Teachers’ Federation. His health began to fail when he was in his mid-50s and he died on 5th October 1927, aged 57, while headmaster of Burwood Intermediate High School, Sydney. He married in 1895 and had four children. He died before any of his eight grandchildren were born. Charlotte Lawson (Lottie) Dash (1872-1960). Born at Hamilton on 2nd May 1872, she was named after her English paternal grandmother. She was aged 18 when her mother died in 1890 and as the eldest daughter had to take on the role of ‘mother’ to her younger siblings. This role would have passed to the next eldest daughter, Flora, when Charlotte took a live-in position as a probationary nurse at the Coast Hospital, Sydney, in 1893. She graduated second in her year at the end of the three-year training course and was promoted to senior nurse. In 1900 she was appointed matron of the hospital at Bourke, in far north-western New South Wales. She married Cornelius (Con) Trader, a senior bank officer, in 1902. Their two sons, both of whom died young, were born in Sydney. Con died in 1956 and Lottie in 1960. Flora Dash (1874-1946). Born at Hamilton on 19th March 1874. It is not known if Flora came to Sydney with her parents and younger brothers and sisters in 1886. She retained close links with her Victorian relations, the John Lawson Dash and Hugh Macdonald families, so she may have stayed in Victoria for some time after the others moved to Sydney. As the second eldest daughter she would have been the logical choice to take over the role of 'mother' from her elder sister, Charlotte, when Charlotte left home in 1893. Flora was then aged 18, almost 19. She may have continued in this role until 1899, when she took a live-in position as a probationary nurse at the Coast Hospital. She graduated first in her class at the end of the three-year training course. In 1902 she was appointed as a nurse at the Rookwood Asylum, Sydney, a position she held until 1906. She may have moved back to Victoria to live with Hugh Macdonald and his family at South Geelong. She was living there when she married Alfred Laver, Superintendent of the Melbourne Benevolent Asylum, in 1911; her cousins, Mary Grace Macdonald and Keith Gordon Macdonald, were the official witnesses. Flora and Alfred had no children. In 1924 they moved to Sydney, where Alfred died in 1927. Flora died in Sydney in 1946. Catherine Macdonald Dash (1876-1878). Born at Kerang on 5th November 1876. She died of diphtheria on 1st November 1878, a few days before her second birthday. She was buried in the Kerang Cemetery. May Macdonald Dash (1878-1916). Born at Kerang on 12th October 1878. In the register of births her name was entered as Mary, but she was always known as May. She joined the Department of Public Instruction as a pupil teacher at Darling Road (Rozelle) Public School, Sydney, in January 1897. She was a gentle person and found it difficult to maintain discipline in the classroom. After her sister Flora left home in 1899 she may have found it difficult to cope on her own with her younger siblings, because she left home to live in a boarding house about December of that year. She married Ernest Taylor, a bootmaker, in 1906, but continued teaching until 1910. They had no children. She moved with her husband to Bowral, on the Southern Tablelands of New South Wales, and died there of tuberculosis in 1916. Rose Lily Dash (1881-1942). Born at Ararat on 23rd April 1881. When her sister May moved out of home in 1899 Rose, then aged 18, would have been left as ‘mother’ to her three younger brothers. She was said to be rather fey, in a whimsical sense, so under her control the situation in the family home probably became somewhat chaotic. This may have been the reason why her elder brother, Ebenezer, interrupted his career to return to Sydney in mid-year 1900 to take charge. Rose was living in Sydney with her brother, Alfred, when she married Sidney Alfred Lawrence on 17th July 1915. Lawrence had enlisted in the A.I.F. in the previous month and was posted overseas three weeks after the marriage. He served in Gallipoli and France, and married bigamously when on leave in England. Rose was granted a divorce when he returned to Australia in 1919. She died in 1942 and was buried with her grandfather, John Macdonald, at Rookwood Cemetery, Sydney. Hugh Campbell Dash (1883-1934). Born at Ararat on 11th November 1883. He was tall and slim and was said by his brother George to be the cleverest of the Dash boys. He was an accountant for the Sydney Fine Art Framing Company. He married Dulcie Harriet Hunt in 1906. They had two children, Emily and Arthur. In the 1920s the family moved from Sydney to Hazelbrook in the Blue Mountains, where Hugh died of tuberculosis in 1934. George Macdonald Dash (1886-1959). Born at Ararat on 2nd January 1886. George was a colourful character, described in a newspaper biography as “Australia’s greatest organiser and publicity man”. He was Chief Recruiting Officer for Queensland in World War I and Director of Commonwealth Loans after the war. He was first chairman of the Brisbane Amateur Turf Club, and for a time was proprietor of the Brisbane Sun newspaper. In Sydney from 1930s he was public relations officer for the Church of England’s social services under the chairmanship of Canon Hammond, organiser for Red Cross appeals, and a book publisher. He published the first books in the Jungle Doctor series, written by Paul White. He married Alma Beatrice Judd in Sydney in 1906. They had 15 children, three of whom died in infancy. George died in Sydney in 1959. Alma died in Brisbane in 1966. Alfred Campbell Dash (1888-1949). The youngest of the family, Alf was born in Sydney on 17th February 1888. He was two years old when his mother died and was raised by his elder sisters and eldest brother. He was an outstanding student at school. In 1902 he was dux of Form III at Sydney Grammar School and was awarded the Junior Knox Prize, the highest academic award in the Lower School. He told his son, Geoff, that he wanted to do Law but couldn’t because of the family’s financial position. Instead he did Pharmacy. He was apprenticed to Washington H. Soul Pattinson & Co. and qualified with distinguished results in the two-year pharmacy course at Sydney University. In 1917 he married Marion Brown, who died after a miscarriage in 1921. He re-married in 1926 to Vida Sweeney. They had one son, Edward Geoffrey (Geoff), born in 1927. Alf died in 1949 at his home in the Sydney suburb of Canterbury. 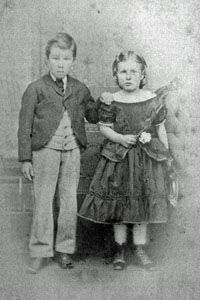 eldest children of Catherine Macdonald & Edward Dash. eldest surviving child of Catherine Macdonald & Edward Dash. At 21 he became head of the family after both parents died. Thomas Gibson (Gib) Hamilton (1875-1953). Born at Hamilton, Victoria, on 19th August 1875 after the death of his father. He became a stepson of Hugh Macdonald when Hugh married Gib’s mother, Mary Grace Hamilton (née Cross), in 1881. He worked as a handyman and assisted Hugh Macdonald as a “teacher without pay” at Granya. He stayed at Granya when Hugh moved to Shepparton and bought a dairy farm. He married Ada L. Hindle in 1909 and they had five children. He enlisted in the A.I.F. in 1915, serving as a private in the 4th Field Ambulance and was badly gassed while in France. He died at Tallangatta, near Granya, in 1953. Kate (Kit) Proctor Macdonald (1882-1962). Born at Hamilton on 7th October 1882. The eldest of 13 Macdonald children, she commented to her niece that she could hardly remember a time when she didn’t have a baby on her hip. She trained as a teacher, starting as a pupil teacher in 1902 at Shepparton Primary School. She taught in various country towns until 1915, when she resigned and married Charles Payne Harold Holbrook. They had one daughter, Grace Lotus, born in 1917. In 1923 they moved to Somersby, New South Wales, to develop a citrus orchard, but returned to Victoria in 1927. In later life they settled in Queensland, where Kit died in 1962. Hector Ernest Campbell Macdonald (1883-1947). Born at Hamilton on 10th October 1883. Like his father and elder sister he trained as a teacher, starting as a pupil teacher at Mooroopna, near Shepparton, in 1903. He taught at several small country schools before being appointed head teacher at Stonehaven, near Geelong. He spent many years as head teacher at Swan March, near Colac. He married Sarah Helen Star in 1914 and they had three children, two of whom died as infants. Hector died aged 63 in 1947 and his wife, Helen, in 1975. Keith Gordon Macdonald (1885-1956). Born at Hamilton, Victoria, on 22nd August 1885. He was a bank manager at the time of his enlistment in the A.I.F in 1914. He married Frannie Ogburn in 1914 shortly before being shipped overseas. He rose to the rank of captain and served at Gallipoli, the Middle East and France. He was awarded the Military Cross in 1917. He had one daughter, Nancy. He lived the later part of his life at Brighton, Victoria, and died in 1956 aged 70. Grace Macdonald (1887-1889). Born at Hamilton, Victoria, on 17th April 1887. She moved with the family to Granya in 1889 and was accidentally drowned in a shallow pool near the teacher’s residence on 12th May 1889. She is buried in the Granya Cemetery. Her name is engraved on the Remembrance Gateway to the Granya Heritage Centre, which records the names of all those known to be buried in the Granya Cemetery. Ruby Macdonald (1888-1976). Born at Timor, Victoria, on 17th September 1888. She married Frank Russell (Russ) Harris on 25th September 1915 in a double ceremony with her sister Kit and Charles Holbrook. For part of their life they lived at Merbein, near Mildura, where Russ owned a fruit block. Later they moved to Geelong, where Russ resumed his earlier trade as a builder. They had two children. Like many of the Macdonald family Ruby was musical and played the organ at the Baptist church in Geelong. Hugh Murray Macdonald (1890-1960). Born at Granya, Victoria, on 17th January 1890. He studied theology and was ordained as a Baptist minister. He officiated at the weddings of several of his siblings and their children. He married an Englishwoman, Ethel Maude Trehearne, in 1924 and they had four children, all sons. Hugh was a ‘stirrer’, and his sermons often highlighted the poverty, poor housing and lack of support for the ‘battlers’ in the community. They attracted the attention of some of the more conservative church leaders, who made life difficult for him. He resigned from the church in 1946. Hugh and Ethel stayed in Melbourne, finally settling on a poultry farm at Templestowe. Hugh became a successful insurance agent for the AMP Society. He died suddenly of a heart attack in 1960. Dulcie Dash Macdonald (1891-1988). Born at Granya on 18th August 1891. She trained as a teacher, starting at Shepparton Primary School in 1907, and taught at many schools throughout Victoria until she resigned in 1921 to be married. Her Education Board reports described her as “bright and inspiring” and “an excellent teacher”. She married Rulion (Rule) Rattray and they had two daughters, Joan and Dorothy. In the 1950s she returned to teaching in temporary positions in Melbourne, retiring again in 1962. She retired with her husband to Lakes Entrance, Victoria. He died in 1970 and she in 1988. Norman Macdonald (1892-1917). Born at Granya on 22nd November 1892. After leaving school he worked as a bank clerk. He enlisted in the A.I.F. in 1914 and served with the 13th Battalion at Gallipoli. After the evacuation he was promoted to 2nd Lieutenant and seconded to the Imperial Camel Corps in Egypt. He was promoted to Captain in December 1916 and rejoined his unit in France. Shortly after, on 4th February 1917, he was killed in action. He was buried in the Warloy-Baillon Communal Cemetery, near Amiens in France. Mona Macdonald (1894-1976). Born at Granya on 28th February 1894. She trained as a nurse. She married John Keith Spalding, a dentist, in 1924. They had four children. Her husband died at Mildura in 1970 and she died there in 1976. Daisy Macdonald (1895-1981). Born at Granya on 10th October 1895. She trained as a schoolteacher at Melbourne University, graduating in 1917 and being awarded the Gladman Prize for 2nd in her degree. Her first teaching position was at Mildura High School, where she became engaged to John Harold Davidson, a telephone engineer. They had known each other as children when both families lived in Geelong. Daisy resigned from the teaching service when they married in 1920. They moved to Sydney, where their three children were born. They moved in 1927 to Wagga Wagga, in country New South Wales, and then in 1942 to Melbourne. Daisy returned to teaching during the war, and later to studying and received a Masters Degree in Education. She retired with her husband to the Dandenong Mountains, east of Melbourne. After her husband’s death in 1971 she moved to Mt Gambier, South Australia, to be near her daughter, Jean. She died at Mt Gambier in 1981. Eric Gladstone Macdonald (1897-1972). Born at Granya on 28th July 1897. He was employed as a clerk when he enlisted in the A.I.F. in 1915. He served with the 12th Battalion in the Middle East and France as a gunner and bombardier. After the war he worked as a bank officer in remote areas of Western Australia. He married Margaret Amelia Norrish in 1940. They had no children. Eric re-enlisted in 1940 and served in Palestine and New Guinea before being discharged in 1944. During the 1950s he was a bank officer at Armadale, Western Australia. He died at Armadale in 1972. Flora Mavis (Maeve) Macdonald (1899-1959). Flora was the youngest daughter, born at Granya on 21st July 1899. As a child she was seriously affected by an illness remembered as either measles or meningitis, which resulted in epilepsy and other ongoing mental illness. She lived with her mother and never married. She was admitted to Ballarat Mental Hospital in 1944 and died there in 1959. Rex Campbell Macdonald (1900-1983). The youngest of the children, Rex was born at Shepparton on 26th December 1900. He worked as a stock and station agent at Kerang. He married Catherine Elizabeth McKenzie in 1936. They had one son. Rex enlisted in the army in May 1940, giving his year of birth as 1905, and served in New Guinea. He was discharged in 1944. The family lived in Melbourne before moving to Caloundra, Queensland. The parents retired to Buderim. Rex died in 1983 and Catherine in 1992. 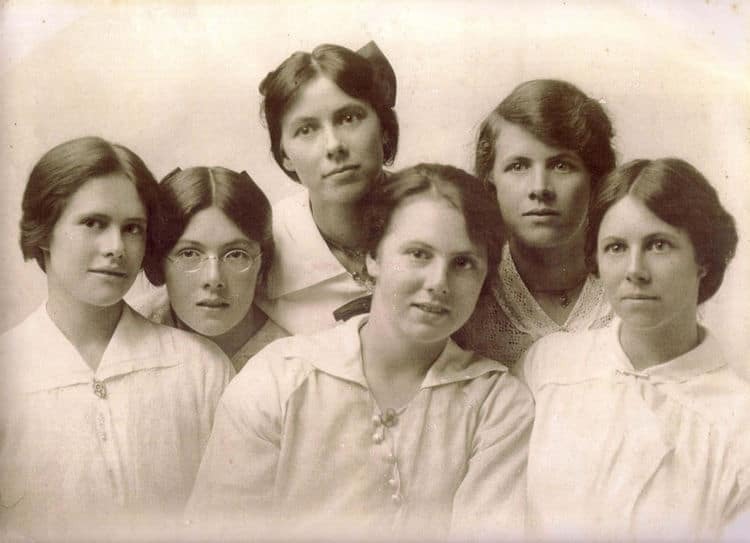 L-R: Daisy, Mona, Dulcie, Flora Mavis, Ruby, Kate. We wish to thank the many family members who gave of their time, recollections and old family photographs to help us compile this history, in particular Grace Boyd, Jean Cameron, Robert Dash, Anne Davidson, John Davidson, Ralph Davidson, Doreen Griffin, Peter Griffin, John Macdonald and Renn Wortley. We also wish to thank all the staff the various archives, history centres and record centres who provided us with valuable information, particularly Duncan Grant and Catriona McLeod of An Iodhlann, Tiree, Ray Rowsell of the Portland Family History Group, Ian Black of the Hamilton History Centre and Edna Warnock of the Granya Heritage & School Management Committee. Anon. (2003). Island of Two Harvests – A Historical Guide to the Island of Tiree, An Iodhlann, Tiree. Capper, John (1853). The Emigrant’s Guide to Australia, George Phillip & Son, Liverpool. Charlwood, Don (1998). The Long Farewell, Burgewood Books, Warrandyte, Victoria. Charlwood, Don (1999). Settlers Under Sail, Burgewood Books, Warrandyte, Victoria. Dash, Edward (1853). Journal of a Voyage by the Ann Dashwood from Liverpool to Australia 1853, Dash Family History Series No.1, 1975. Dash, Keith Macdonald (2001). Dash Family History – The Macdonald Line, Dash Family History Series No.6. Fraser, Bryce (1983). The Macquarie Book of Events, Macquarie University, Sydney. Hall, Barbara (2005). The Macdonald Family in Australia. Kennedy, Donneil (1994). The Land Below the Waves – Tiree Past and Present, Tiree Publishing Company. “Miriam” (Flora MacDougall) (1925). Footprints of One Bonnie Scotch Lassie. Published in Autumn Leaves, Vol.88 (1925), USA. Prentis, Malcolm D. (1983). The Scots in Australia, Sydney University Press, Sydney.